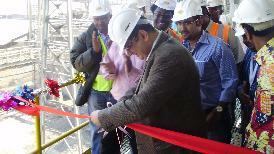 A preleach section was commissioned at Shalina Resources' Chemaf plant at Usoke Ave in August 2011. Procurement and construction was completed within 9 months by an inhouse projects team. 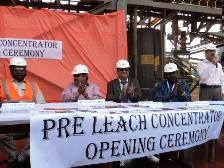 The pre leach process enables maximum utilisation of free acid generated in the Cu SX/EW plant. The aim being to reduce consumption of acid and other reagents like lime stone used for neutralization in subsequent stages thereby reducing cost of production. The process will also enable Chemaf to re-circulate the water from horizontal belt filter and reduce overall fresh water requirement, improving the overall water balance.